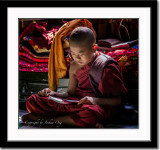 Finally, I completed the gallery of images from Myanmar I took over a year ago. Phew! I worked on them early on but somehow after it was approximately 90% done, I got sidetracked and put everything aside. Oh, well. This was my first visit to Myanmar and I got the feeling that it won't be the last. I was just scratching the surface, so to speak. What is special about Myanmar? It is a very photogenic country and that's what attracts photographers from all over, including myself. The old city of Bagan is beautifully unique and you have to experience the beauty at both sunset and sunrise. Yes, get up at 5:00AM and be there on the temple top for sunrise and stay until it is pitch black to enjoy the view of lit temples. Myanmar I saw remains largely unspoiled. Except for Yangon, the capitol city, there are not many high-rises, hotels or resorts that spoil the view. The people are really friendly and they let you take pictures of them doing their daily activities, especially at markets, ideal for street photography. At least most of them do that without asking for donation. Yes, there are a few that do that but those are more the exceptions rather than the rule. For the very first time in my photography life, I went on a photography trip without any DSLR. I actually combined this trip with a trip to Bali, as well. Two full frame mirrorless cameras, a few native lenses and a Leica-M WATE lens made up a fairly light-weight and compact setup. And the main important aspect is, it pulled off the task without any major glitch. Frankly, there were cases that enabled me to take interesting images with more ease. Like holding the camera high above my head while pointing it down and low angle or ground level position of the camera while I still can use the monitor to compose the images, etc. Enjoy the gallery and please feel free to leave your feedback on the gallery itself as you see fit or on the images directly if you feel like it. Thank you for visiting! All the sudden, he started kissing the monitor! Wonderful images in this phortolio, My highest regards! d'ambiances. petite question : avez vous eu des problèmes de durée de vie avec les batteries du sony ? Fabulous work ! Stunning and beautiful ! V.
A wonderful gallery of images. Really like all the portraits. A joy to see this. Thank you! "V"
The work from a Master of Photography ! Simply Beautiful !!! A great gallery showing the great spirit of Myanmar just as I remember it from 1996. Thank you for amazing photos. Great images, just as I remember Myanmar. Seeing these I want to go back as well. Fabulous Gallery, excellent images Joshua, lots of breathtaking pictures outstanding compositions. I have seen this from the first hand on your IPad...,but not bored to see these beautiful pictures again ,Joshua.. Super!.. A most beautiful work ! A pleasure to see all these great images. BV. beautiful work.. I was in Myanmar three years ago and can hardly wait to return.. well done !